Protesters choked the streets of London around the evening rush hour on Jan. 30 as a series of emergency marches converged. 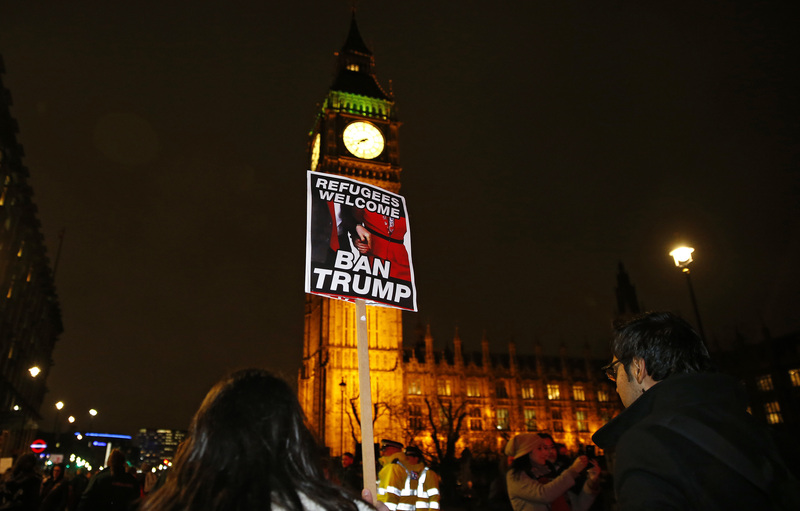 Demonstrators were objecting to the government’s invitation to the new U.S. president to conduct a state visit to the United Kingdom. An impressive array of groups and individuals came together on short notice, joined by many city workers, normally a phlegmatic set but moved in sufficient numbers to make this an inspiring protest. A group coordinated by the Jesuit Refugee Service here in Britain also joined the large protest outside Downing Street. Though the rallies were billed primarily as protests against the invitation to President Donald J. Trump, protesters also condemned the new U.S. administration’s travel ban against seven majority-Muslim countries. There is considerable anxiety across the country that the London government might have rushed too quickly into a restatement of the so-called special relationship between the United States and the United Kingdom. Prime Minister Theresa May was clearly delighted to be the first foreign leader to get a White House visit, perhaps stung by her former leadership rival Michael Gove’s scooping a newspaper interview with the then-President-elect Trump. Her satisfaction is not universally shared across the country. The chants swelling up from the London crowds alternated between demands that the proposed state visit, negotiated during Ms. May’s White House visit, be canceled and calls to rescind the 90-day travel ban and the closure of U.S. borders to certain refugees. The many banners and placards on display broadened the list of concerns, covering Mr. Trump’s behavior toward women and his populist style as well. There were many references to the 1930s ride of European fascism, reflected in media reports that covered largely inaudible speeches from a hastily constructed platform near Downing Street. She added Britains “can't pretend that what is happening in the U.S. is not our concern." There is now an official government online petition, entitled “Prevent Donald Trump from making a state visit to the United Kingdom.” By late afternoon on Jan. 31, signatories were heading toward two million; only 100,000 are needed to require a debate in the House of Commons. The government so far remains determined not to withdraw the invitation to Mr.Trump. It is a fundamental Christian concern that, no matter how hard we try, we cannot ignore. Jesus, in the Gospels, is precise on this point; the prophets of the Hebrew Bible are, too. After attending the protest, the Jesuit superior at London’s Farm Street Church, Dominic Robinson, S.J., said that the president's "appeal to Christians by prioritizing Christian refugees and refusing entry to those from Muslim countries is, in fact, a paradoxically pernicious way of promoting what is contrary to Gospel values." It appears many Christians, both in the United States and here in Britain, understand this insight and believe that they do not have the option to remain silent in the face of these extraordinary policy decisions since the president’s inauguration. It seems likely that the demonstrations that erupted in London on Monday night and in so many other towns and cities around the world will soon occur again. David Stewart, S.J., is America's London correspondent.